We’d love your help. Let us know what’s wrong with this preview of Spartan and The Green Egg by Nabila Khashoggi. Spartan, his three friends, and his dog, Grimm, as they travel the Universe. The mission of this talented team is to gain and share knowledge of their amazing discoveries. With the power of their minds, they made contact with a race of alien explorers, who communicate with them via an egg-shaped spaceship that is itself an organic alien being. Their expeditions are made ev Spartan, his three friends, and his dog, Grimm, as they travel the Universe. The mission of this talented team is to gain and share knowledge of their amazing discoveries. With the power of their minds, they made contact with a race of alien explorers, who communicate with them via an egg-shaped spaceship that is itself an organic alien being. Their expeditions are made even more exciting through the use of new technology and cool gadgets, provided by their new friend, who goes by the name of Egg. To ask other readers questions about Spartan and The Green Egg, please sign up. This book is about Spartan and his friends going on a adventure i their imaginations in the big round thing called egg. the pictures were awesome and they were one of the best parts of the book.i like the pictures with just juma and yara because I like their regalia's and I really like the logo for the book. My favourite part was when they met the two native children juma and yara. they were fun and I learned a lot from them about their people. It made me sad when they where cutting down the trees but it made me laugh when they kicked the loggers butts. I learned that you have to plant another tree every time you cut down a tree.we learned many many things about the Amazons way of life. I think that lots of kids would like it. it's a great story with a good message and Nabila Khashoggi is a awesome writer! Spartan and the Green Egg was a wonderful book full of adventure and beautiful illustrations! I felt myself completely drawn into the story as Spartan and his friends set of into the unknown. Spartan, his three friends, and his dog, Grimm, travel the Universe. The mission of this talented team is to gain and share knowledge of their amazing discoveries. Their expeditions are made even more exciting through the use of new technology and cool gadgets, provided by their new friend, who goes by the name of Egg. In This book A Trip to the Rainforest, the team’s introduction to the rainforest and all its wonders is made even more fun by the company of two Native Amazonian Indians who introduce them to their way of life. This is an amazing book for kids! my daughter was so excited when she laid eyes on the book and the Illustrations she couldn't wait to begin reading it and when she did you could see her imagination light in her eyes and could see she was drawn into the story just as I was! I loved that the story was Native in origin as well. It had amazing messages and being Native ourselves it was really special to us! We loved learning about the Amazonians and their traditions and we talked about how similar they were and how different from our own people. The ending was superb as well and we laughed at the loggers as they were so scared and wished it could happen in real life! as we have been to protests to stop them from cutting our forests down but to no avail we need EGG! You have written such a wonderful and inspiring book Nabila! and we can not wait to read your next one! My six year old and I read this together. She was really enamoured with the maps. In fact, it took us three tries to sit down and actually read the book because she just wanted to look at the maps and find all of the fun little treasures in them. Once we finally made it past the decorations to the actual book itself she loved the full-color comic book styling and I have to agree with her. It gave the book a little something different. The environmental themes are ones we've all heard before, but My six year old and I read this together. She was really enamoured with the maps. In fact, it took us three tries to sit down and actually read the book because she just wanted to look at the maps and find all of the fun little treasures in them. Once we finally made it past the decorations to the actual book itself she loved the full-color comic book styling and I have to agree with her. It gave the book a little something different. The environmental themes are ones we've all heard before, but I particularly appreciated the clarity with which replenishment was addressed. The reader is not only reminded that we (humanity) need to replace every tree we cut down, but that we need to replace them with the same or similar trees. Otherwise we'll just end up with a planet full of scrub pines. It did fail to address the loss of mature forests and the effect this has on those who live in and around the jungle, but I suppose only so much can be presented in a children's book. I found the little bit of education about Amazonian culture to be interesting. I was a tad concerned that the pictures appeared to be fairly pan-indian, even if the text wasn't. But my daughter didn't notice. Of course not all readers with be 6, but I found the book a bit long for a six year-old's attention span. The mental transcendentalism in the beginning also went way over her head. She kind of glazed over during that part of the book, but came back strong once the Amazon appeared and cheered for the children's accomplishments at the end. As an adult I found it all a little abrupt, but it obviously worked on a child's level. She's also spent hours just looking at the pictures to find new details in the forest scenes. Oh, and I want that tree house!! All-in-all, the book would make a good addition to most children's libraries. This was a terrific book. The premise of the children (Explorers) using their imagination and having it take them to some great places is terrific. I also love that the story has a message - a global message even. Protect what you use and replace what you take. The illustrations are masterful and colorful. The style is that of a comic book type flow and perhaps that is the feature I most strongly like. My son has special needs and it is often difficult to get him to try to read. But he loves co This was a terrific book. The premise of the children (Explorers) using their imagination and having it take them to some great places is terrific. I also love that the story has a message - a global message even. Protect what you use and replace what you take. The illustrations are masterful and colorful. The style is that of a comic book type flow and perhaps that is the feature I most strongly like. My son has special needs and it is often difficult to get him to try to read. But he loves comic books. This book grabbed his attention right away - as soon as I opened it. The rule is he can have books after I review them but this one couldn't wait - I had to "wait my turn". This was the first Spartan book but there is already a second one and another on the way. I would love to continue to follow the explorers on their adventures and see what other imaginative trips they take and what they can change in the world. I give this book 5 stars and will be following Nabila for future editions. I received this book for review purpose, trying to read a graphic novel to your kids I find a little tricky. The story is about Spartan and his friends. They go on an adventure to a rain forest and discover and learn wonderful things. Kinda reminds me of the show "Little Einsteins"
The artwork is a cutesy anime very colorful, and the whole book is made from recycled papers. Good for childrens beginning in graphic novel reading. I thought this book was great. The colors are really bold and bright. I like that it reads like a comic book because who doesn't like a good comic. Nabila takes readers on an adventure but also teaches something on the way which I found informative. The illustrations were wonderful. Story line was easy to follow for the kids. It would have been nice to see the children be more hands on involved with solving the issue. I would be clear with children when reading that this story is fantasy with a good environmental theme. Good book, my nephew loved it. Fun, colourful and imaginative a must read for those who have children who are just starting to read. This book is a graphic novel aimed at children and possibly early teens. It's the story of a group of friends who through the power of their minds, make contact with an alien on a distant planet. He sends a green egg to them which is both a massively technologically advanced spaceship, but also his means of communicating with the group of friends from his home world. The group of friends then set off on their first adventure inside the green egg. On this occasion, they visit the Amazonian rainfo This book is a graphic novel aimed at children and possibly early teens. It's the story of a group of friends who through the power of their minds, make contact with an alien on a distant planet. He sends a green egg to them which is both a massively technologically advanced spaceship, but also his means of communicating with the group of friends from his home world. The group of friends then set off on their first adventure inside the green egg. On this occasion, they visit the Amazonian rainforest. First of all me and my preferences. I'm mid 30's. I have 1 child (for now) although he's still crawling so not ready for this yet. I'm not a massive reader (which I'm well aware is weird for this site). However I do really enjoy graphic novels and I do read those pretty often. I didn't read the book with a child so it's a review from an adult male perspective. I enjoyed the book. It took around 30 minutes (I'm not the quickest) to read the whole thing. Usually the first story in a series can suffer due to explaining how the characters say gained the superpowers or in this case, made contact with the alien being. I didn't feel that with this book. By page 15, the characters have made contact, got in the ship and they're off on their adventure! The book is educational in that it relates to the reader why trees are important "we breathe in what the trees breathe out and the trees breathe in what we breathe out" and then the characters learn about replacing the trees that are cut down and that you need to do it with the same type of trees. Plus once more the why behind it. I liked this as it felt less like preaching as the why was explained at a basic level. For what is in real life a massively complex issue I think a basic level is probably the best you could do for kids. The antagonists aren't painted too black and it is explained why they do the thing they're doing to provide a reasonably balanced viewpoint. I really like the illustrations throughout. They're bright, colourful and fun. Neither too realistic or too cartooney. Great for kids or adults. I didn't find many downsides personally. The reasons I gave 4/5 instead of 5/5 are these. I wasn't sure that referring to Amazonian Tribespeople as "Indians" was exactly politically correct. Although nowadays we can go a bit OTT with that sort of thing. Also, food appears to be highly abundant for the tribespeople too which I'm not sure is accurate, but as I've never met them, what do I know? Plus, having them starving in a kids book would be very depressing and possibly even distressing so again a minor issue. The book did feel a little abrupt in it's ending for me, but I think a child would be happy with it. It certainly let the book open for the further adventures of the characters. Plus to be fair, I did feel like I want to read them as they become available. There's a good chance I will buy future adventures. A compliment in itself. I'd be happy for my son to read it when he gets to the right level. It's bright, positive educational and would encourage him to care about the environment. So in summary, a bright colourful amd fun story, with a positive and educational message about the environemt. All in all pretty good. I'm happy to recommend it. When I first pulled this book out and showed it to my son who is in first grade, he danced around, wanted to look at it and promised he would hurry and do his homework. He thoroughly enjoyed the book so I seriously considered rating this 5 stars for his review. This book is a graphic novel about four kids, a dog and an alien egg that travel to the Amazon rain forest. The book teaches some beginning science and ecology concepts. If your kids like The Magic School Bus series (mine does) they probab When I first pulled this book out and showed it to my son who is in first grade, he danced around, wanted to look at it and promised he would hurry and do his homework. He thoroughly enjoyed the book so I seriously considered rating this 5 stars for his review. This book is a graphic novel about four kids, a dog and an alien egg that travel to the Amazon rain forest. The book teaches some beginning science and ecology concepts. If your kids like The Magic School Bus series (mine does) they probably will enjoy this and the age/reading level is likely comparable. PROS: The COLOR in the illustrations is wonderful. Bright, eye-popping color in vivid jewel tones. It will get your kids attention - it sure got mine. In the front cover, there is a world map, with the Amazon Jungle high-lighted. We paused here first to review the continents and the setting for the story. Great idea, that. Boys and girls are in this story and there are kids of color. My son is adopted (he calls himself brown, I am pink and his father peach) and he said about the character Max (also my son's name) "he is brown like me." At times, it is hard to find stories with kids of color (unbelievable sometimes) and my son totally loves to relate with kids that look like him in books. The book is both imaginative and informative, a feature I adore. Yeah, figure the odds an alien egg is flying kids off to the Amazon, but Mrs. Frizzle's school bus is not any less unlikely. The 'brain' of the group talks about the symbiotic relationship between trees and humans. The children meet some Amazon natives, who are dismayed about the fracturing of this relationship because of the logging. The book gives some description about why the logging is taking place and the kids, with the help of the alien, who poses as an ancient spirit, fix the problem by replanting trees. The story is simplified, yes, but it correlates for the age group being addressed. It doesn't demonize or judge, just keeps it to the facts, with a dash of magic of course. My 1st grader is a little young to read this on his own, so we read it together and spoke of some of the issues addressed in this book. All in all, this book is geared for kids and I think they will WANT to read this esp with the great colors. Read it with your child and it gives you an opportunity to review some science. We will look forward to the next installment of the series. I would recommend it for grade school children. An exciting educational adventure story that’s an imaginative visionary masterpiece! Spartan and the green egg is a must-have for any child’s bookshelf, as it is great fun and is essentially educational as well as enjoyable. It is a children’s fantasy adventure in the style of a comic book, containing pictures and maps. This book in the form of a brightly colored, eye-catching graphic novel this easy-to-read story will appeal to the younger reader in addition to those being introduced to reading An exciting educational adventure story that’s an imaginative visionary masterpiece! Spartan and the green egg is a must-have for any child’s bookshelf, as it is great fun and is essentially educational as well as enjoyable. It is a children’s fantasy adventure in the style of a comic book, containing pictures and maps. This book in the form of a brightly colored, eye-catching graphic novel this easy-to-read story will appeal to the younger reader in addition to those being introduced to reading for pleasure. I feel strongly that it is incredibly important to encourage children to read, as it broadens their imaginations by introducing them to the wonders of the written word. This brilliant book does just that by transporting you to tropical paradises and breathtaking places, which are filled with the extraordinary and the alien. With a clear environmental message this enlightening tale will illuminate and inspire many youngsters, therefore it is something that I would recommend to primary schools too. 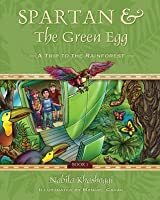 Spartan and the green egg is an adventure that takes you to the heart of the Rainforest, wherein you will experience an amazing journey filled with new discoveries and learn important facts. Author Nabila Khashoggi has created something that is not only visually appealing and attractive to look at on the shelf and while reading, but most significantly of all a story containing thought-provoking inner meaning and noteworthy connotation. It is the environmental and political messages that really stands-out within such an original book, being the main element that would make this book appeal greatly to adults and parents. The genius concept of the space-changing and time-travelling green egg in addition to the powerful green spirit was just brilliant. Beautifully bound and published this delightful book is one that I can see flying off the shelves and which leaves me hoping that Spartan and his friends will have many more adventures! I am very impressed by this satisfying story for 6 year olds (6-10 yr old target readership I would say), and so I would recommend it to the young child reader without hesitation. Mother to Spartan and Layth, lives in New York with her family. The imagination is a powerful thing as we see in the recently released in the first book of the series Spartan& the Green Egg, A Trip to the Rainforest. In this first installment to the series we meet Spartan, his three friends; Max, Tor, & Kattie and Spartan begins the story telling his friends about this book his dad got for him. The book tells you how to contact aliens from outer space. So the children following the instructions in the book, decide to take this on to see if its true. And before long they are taken on an adventure they will never forget. The author takes us on a fascinating journey through the rainforest to teach us a little more about it and how its plant and animal are being depleted almost daily. Follow along as this unique group of caring children travel to the Amazon. With colorful pictures and alot of information we can imagine that we are there too! A trip to the Rainforest is the first in a series of graphic novels for children, which follow the adventures of a group of children, led by the eponymous Spartan, who make contact with an Alien who offers to take the children anywhere they wish. The book is an educational comic intended to teach children about the Rainforest and the dangers that deforestation causes, both for the wildlife and indigenous people that inhabit it. As an educational book it works well. I can imagine children being A trip to the Rainforest is the first in a series of graphic novels for children, which follow the adventures of a group of children, led by the eponymous Spartan, who make contact with an Alien who offers to take the children anywhere they wish. As an educational book it works well. I can imagine children being engaged with the story. The comic book style and some of the plot elements like the alien’s powers and the children banding together to re-grow the trees that the foresters are cutting down, stop it falling too much into the realm of overly preachy Edutainment. The art is nice, even if the characters do seem to be pulling the same facial expressions in every panel. I’m not a fan of the colouring style however, it’s purely personal taste but I’m not a fan of colouring that looks too digital. While the colouring is suitable for the rainforest setting with lots of rich greens and vibrant colours used for the plants and animals. There’s far too much use of the burn and highlight tools which give it a cheap photoshopped feel. The green used on every page to separate the panels is also a little too garish and I’d have preferred if it was mixed up a little bit. If you’ve got small kids, by all means give this one a go. I’m sure they’d enjoy it, it’s a fun colourful adventure with a good message, just don’t expect there to be much to enjoy for the adults. Recently I was asked to review the book Spartan and The Green Egg by Nabila Khashoggi. I thought it would be an interesting book to review due to my love of nature. I was not disappointed. This hard cover book is the first in a series for Ms. Khashoggi. The story opens with the main character Spartan and his three friends, meet up in the tree club house. Spartan proceeds to tell the group about a book he has received that mentions how to contact aliens. The group collectively decides, through the use of the power of imagination, that they will indeed contact aliens from outer space. They create the look of their spaceship and where they want to go. Through great concentration they end up having an alien in a green egg appear. This green egg is actually their spaceship which take them to the Amazon Rainforest. They have a few bumps along the way which could put them in danger. However, there they meet Amazonian kids who take them back to their village. Spartan and friends learn how the children live in the village. They also experience a dream through a village shaman who shows them that the Rainforest is in grave danger from people who destroy it. This could mean the end of the Amazon Rainforest and extinction of many animals. The group decides to do something and help save the Rainforest. Do they accomplish their task? Are they forever stuck? Will it be enough? What about that green egg alien? You decide, read the book! This book is for the older child who can read pretty well. The books illustrations were done by Manuel Cadag and quite impressive. Usually when I have read books the illustrations are on opposite pages or sparse. This book however, was written comic book style with the illustrations and words interacting with each other. I don't know a single kid that would not like this book. To say the least, this book is excellent and I highly recommend it. I look forward to many more books in this series. Spartan and The Green Egg deserves my 5 stars! Disclosure: I was given this book to review for free. The words and opinions expressed here are 100% my own. It took me a while to write this review because I wanted to share it with some of the kids I know to get their thoughts, but the book was a little too advanced, so I will have to base it on my own impressions. Spartan and The Green Egg: A Trip to the Rainforest is a wonderful idea. Spartan and his friends travel to the rainforest in a alien spaceship and learn about the people of and the dangers to the rainforest. It is a cute story, though I would hav I received this book as a Goodreads giveaway. Spartan and The Green Egg: A Trip to the Rainforest is a wonderful idea. Spartan and his friends travel to the rainforest in a alien spaceship and learn about the people of and the dangers to the rainforest. It is a cute story, though I would have preferred if it were a little more in-depth, particularly more about the customs, food, etc., of the people they visited. I did have a number of problems with the book. First, it took a very long time to introduce the friends. All of their names should have been used in the first page or two so that the reader knows the names. Their interactions were fun and amicable, and each had their own personality, but I didn't learn one name until halfway through the book! The people of the rainforest were only referred to as "Indians" instead of telling what specific group Spartan and his friends were visiting. Finally, the loggers were depicted as a 1990s villain in one of the many environmentally aware shows and movies of that era. They were cutting down trees for no other reason than to cut down trees until Spartan and the alien scare them into more responsible stewardship. It would have been better to explain why so many trees are needed, and perhaps how the children reading the book can contribute the saving the rainforest through recycling or other means. Disclaimer: I received this book as a Goodreads giveaway on the premise that I would review it. Spartan, an adventurous boy, his three human friends, and his dog Grimm make contact with an alien that manifests itself in the shape of an egg. Using its vast powers, they go on exploration journeys. In this introductory volume, the kids travel to the Amazon rainforest and learn a little bit about the locals, as well as about deforestation. This graphic novel is intended for kids about eight to ten, an Disclaimer: I received this book as a Goodreads giveaway on the premise that I would review it. This graphic novel is intended for kids about eight to ten, and the main character is named after Nabila Khashoggi’s son. It’s very light edutainment, with little sense of conflict or peril. The children have largely interchangeable personalities, and the Egg makes everything just a bit too easy. I liked that the lumber company employees weren't characterized as villains, but they seem awfully superstitious and easily tricked. It also seems highly unlikely that anyone will listen to their crazy story about forest spirits, and the locals won’t have an advanced alien and super technology on their side next time. On the other hand, a shaman does show the power to send bad dreams, so perhaps it will work out. This is one book that could have done with a glossary, or a text page with more concentrated information about the Amazon. About the book: Spartan and the Green Egg Children’s Book Takes a Trip to the Rainforest - Author Nabila Khashoggi has written a fun and educational new children’s book, Spartan and the Green Egg, a Trip to the Rainforest that is sure to provide excitement and wonder as young readers travel to the rainforest to experience an amazing journey. A Trip to the Rainforest is the debut book in a continuing series of ten adventures with Spartan, his three friends and his dog, Grimm and their travels of t About the book: Spartan and the Green Egg Children’s Book Takes a Trip to the Rainforest - Author Nabila Khashoggi has written a fun and educational new children’s book, Spartan and the Green Egg, a Trip to the Rainforest that is sure to provide excitement and wonder as young readers travel to the rainforest to experience an amazing journey. A Trip to the Rainforest is the debut book in a continuing series of ten adventures with Spartan, his three friends and his dog, Grimm and their travels of the world. The mission of this talented team is to gain and share knowledge of their amazing discoveries. With the power of their minds, they made contact with a race of alien explorers, who communicate with them via an egg-shaped spaceship that is itself an organic alien being. Their friend, Egg introduces them to new technology and cool gadgets along the way. My thoughts: First of all, I am simply not a fan of graphic novels. I prefer books in either prose or rhyme and a nice flow to the storyline. I prefer illustrations but not in the form of the graphic novel. I did not realize that this was a environmentally or politically charged storyline. I assumed from the description I received (see above) prior to opportunity to review the book that it was a fantasy or science fiction sort of book. I'm not particularly fond of them, either. I found the book heavy on spiritual (powerful green spirit), a shape-changing time and space traveling egg, spontaneously appearing objects, etc. Let's just say this is not a book I favor or would purchase or encourage others to purchase. Beautifully bound and published it is categorized as Juvenile fiction/Comics & Graphic novels/General. DISCLOSURE: I was provided a complimentary copy in exchange for my honest review. I was not required to render a positive review. “Spartan & The Green Egg” by Nabila Khashoggiis a graphic novel for youngsters that will taken them on a trip to the rainforest. My almost four year old was mesmerized by the illustrations and was captivated by the story. While I feel like the book is geared to kids a little older than mine (possibly 8-12), Miles was overjoyed while we read this book. We did read the story over several nights and he was more than ready to find out about the green egg. Miles asked me several times if we could “Spartan & The Green Egg” by Nabila Khashoggiis a graphic novel for youngsters that will taken them on a trip to the rainforest. My almost four year old was mesmerized by the illustrations and was captivated by the story. While I feel like the book is geared to kids a little older than mine (possibly 8-12), Miles was overjoyed while we read this book. We did read the story over several nights and he was more than ready to find out about the green egg. Miles asked me several times if we could read “the green egg book” so I was happy to oblige. Spartan & the Green Egg starts off with a group of friends hanging out in their tree house checking out a book Spartan’s father purchased at an old book store. The book suggests that they use their minds to make contact with aliens on other planets. With the use of visualization, the kids set out on their journey after making contact with the Green Egg into the rainforest. On this journey, the children learn about an Indian tribe that lives in the rainforest and what it is like for the Indians living there as well as the damages chopping down trees makes when no one replaces them. With these vibrant illustrations by Manuel Cadag in a comic book style presentation, I have to say that we more than enjoyed “Spartan & The Green Egg” by Nabila Khashoggi. Children will learn the importance of replacing what we take from our universe, tap into their imaginations all while learning about an Indian tribe. “Spartan & The Green Egg” will be in our library for a very long time. I know that Miles will be able to read and re-read this book for years to come and enjoy it more when he can read it himself. I was fortunate to receive a copy of 'Spartan and the Green Egg: A trip to the Rainforest' through Goodreads. The book is the first in a children's graphic story series and focuses around four children who learn how to communicate with aliens. The alien, which takes the shape of a green egg transports the children to various locations so that they can learn about the world around them. In 'A trip to the Rainforest' the four children learn a bit about the Amazon and the dangers of over logging. 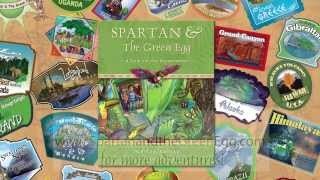 On I was fortunate to receive a copy of 'Spartan and the Green Egg: A trip to the Rainforest' through Goodreads. The book is the first in a children's graphic story series and focuses around four children who learn how to communicate with aliens. The alien, which takes the shape of a green egg transports the children to various locations so that they can learn about the world around them. In 'A trip to the Rainforest' the four children learn a bit about the Amazon and the dangers of over logging. On the whole, I found the story lacking. The book was long enough that it was geared for children agaed 8-9 years, but the information shared was limited and geared towards younger children, who might be less likely to sit and read through the book. The facts presented are a bit loose as well. If I'm going to read something educational to my kids I like when the information presented is solid. The concepts behind the story were great. I like the idea of promoting imagination and inquiry in kids. I think it is important to teach children how important the rain forest is (especially since their parents don't seem to grasp the concept! ); I'm just not sure if the author was able to push these ideals well enough. I think the illustrations suited the book and were well done. I spent more time focusing on them, then the story itself. I particularly enjoyed the maps on the front and rear cover. This book follows a young boy named Spartan, his three friends, and his dog on an adventure to the Amazon rainforest. They get there with the help of a magical alien called Egg which they summon using their imaginations. Once there they meet up with two natives who show them their village. The Shaman of the village makes them aware of the logging going on not too far away, and they decide that they must do something to help. This Magic Tree House meets Avatar for young children introduces readers to the problems of deforestation and disappearing rainforests. An interesting story-line keeps the message from being overwhelming, yet numerous issues are presented and discussed. The graphic novel style is effective in cramming as much information as possible within what is still a reasonably sized children’s story. This format also helps to set it apart from other similar books. Although the proposed solution to saving the rainforest is quite simple (i.e. plant a new tree for every one you cut down), it is not a solution most readers can practice. It would have been a good idea for the book to include other ways readers could help, such as recycling. However, in the spirit of the message, I was also pleased to find that the book is made out of 100% recycled paper. This is a wonderful children's book. It's about Spartan and his friends. It is the debut book in a series of ten adventures with Spartan, his three friends and his dog. They made contact with some alien explorers with the power of their minds, through an egg-shaped spaceship. The spaceship was actually an alien being. The alien becomes their friend and is called Egg. They go on an exciting and educational journey to the Rainforest.Their mission is to gain and share knowledge of the universe with others. I loved this book because it encourages children to let their minds explore and use their imagination. The illustrations in this book were magnificent. The book is an interesting and educational book. I found myself sad at times and laughing at others. There is so much to be learned of the Amazon's way of life. Every tree that is cut down must be replaced. Such wonderful lessons and yet it is very interesting and a fun read. Children need to use their minds to grow. Imagination is a wonderful thing and so much can be done with it. Every child should read this book. I was given a complimentary copy of SPARTAN & THE GREEN EGG by the author, for this honest review. There are some books out there that capture the imagination and spin fantastic tales for all of us to enjoy. They stay with us for years after we've read them as children and we can then go back as adults and enjoy them with new eyes. This is one of those books. The comic book style of the delivery, the art, the description to back up the pictures, and the dialogue itself were all fantastic. As an adult I could enjoy this book the same way I can enjoy any comic. The themes were rather adult, but There are some books out there that capture the imagination and spin fantastic tales for all of us to enjoy. They stay with us for years after we've read them as children and we can then go back as adults and enjoy them with new eyes. This is one of those books. The comic book style of the delivery, the art, the description to back up the pictures, and the dialogue itself were all fantastic. As an adult I could enjoy this book the same way I can enjoy any comic. The themes were rather adult, but the information is delivered in a way that someone as young as three or four could really get captivated. Not just by the pretty pictures, but the words and their meaning. I'm excited to show this to my children and watch them enjoy it. I'm excited for them to come back years later and read it again. I just hope that by the time that happens, these beautiful rain forests still exist in our world today. The book is fantastic, and I just wish I could post more than five stars. It really deserves it and it really deserves to be seen by more people. 10 out of 5 in my mind and I highly, highly recommend it to all. This was a fun book. Once my 3 year old was convinced that it did not contain a monster, he loved it and wants us to read it to him all the time. The story is simple (this is a children's book, it is not intended for adults--it should be simpler than something targeted at my age), but is a good story and is one that is important. The artwork is cute, and makes for a more entertaining storytime for my toddler. The reason this loses a star is because some of the sentences and writing are a little This was a fun book. Once my 3 year old was convinced that it did not contain a monster, he loved it and wants us to read it to him all the time. The story is simple (this is a children's book, it is not intended for adults--it should be simpler than something targeted at my age), but is a good story and is one that is important. The artwork is cute, and makes for a more entertaining storytime for my toddler. The reason this loses a star is because some of the sentences and writing are a little awkward. When reading it aloud I regularly find myself paraphrasing into more natural sentences. The story is still fun, I think this is a quality book for children, and the graphic novel style of it will likely engage a wider range of young readers. Who will hopefully take its underlying message to heart. I look forward to getting my son more of the books in this series! When his friends come to the tree house, Spartan tells them about a book his father found in an old bookstore. According to the old book, with the power of the mind they can communicate with aliens. When they all think about it, an alien comes into the clubhouse. It takes Spartan and his friends on a trip of a life time to the rainforest. This is a fun and educational book about the rainforest. It is one of the most unique books I have ever read. It is laid out in a format similar to that of a c When his friends come to the tree house, Spartan tells them about a book his father found in an old bookstore. According to the old book, with the power of the mind they can communicate with aliens. When they all think about it, an alien comes into the clubhouse. It takes Spartan and his friends on a trip of a life time to the rainforest. This is a fun and educational book about the rainforest. It is one of the most unique books I have ever read. It is laid out in a format similar to that of a comic book, with cells of conversation and colorful illustrations. This format was good because it allowed for more of the wonderful illustrations, but it was also sometimes distracting because I found it hard to tell where to read next. I let my children read it and all of them enjoyed it very much. I would also recommend this book. It is definitely worth the read. I received this book as an early review copy for my honest review and I have given it. The opinions expressed herein are my own. Green Eggs hold the ham! Spartan and his friends contact aliens with their imaginations but the response is not exactly what they were expecting. When Egg appears in their tree house they have no idea what kind of adventures he will take them on. One of the last mystical places on earth, the Amazon holds new enlightenment and adventure for our young foursome. This book is a great addition to the literary world, teaching the next generation about the importance of their imagination and conservin Green Eggs hold the ham! This book is a great addition to the literary world, teaching the next generation about the importance of their imagination and conserving our rain forests. Educational and fun at the same time, allows children's imaginations to run wild. This Book was sent to me by the Author following a request I made to her for it before reading the next Book in the Series which I found out about via Bostick Communications. This was the first Comic Book/Graphic Novel that I have ever read & loved it which is why I read it in a couple of hours. It is for these reasons that I gave it 5 stars out of 5. The Illustration's in the Book were fantastic and kept me engaged in the story. The book started with a young boy telling his friend about a book that he'd read, followed them through what they did to summon the alien egg to their trip to the Amazon. Then once they were in the Amazon it educated you about how to care for the environment (plants and trees) as well as the beliefs of the an Amazonian Indian Tribe. I will not only recommend this book to other people but I will also be using it with my son when I am homeschooling him when we study the Amazon. I got this book for free through Goodreads First Reads! I absolutely loved this book. The illustrations are absolutely beautiful! The book also teaches a good lesson. Spartan and his friends travel to the rainforest after contacting aliens. The alien life form takes them to the amazon where they learn loggers are destroying the beauty and the wonderful lifegiving ecosystem that is the amazon. With the help of the green egg (alien) they tell the loggers to plant a new tree for each one they cut do I got this book for free through Goodreads First Reads! Spartan & the Green Egg is a story told in comic book format. The story is about the adventure of Spartan and his friends Max, Katie, and Tor and their dog Grimm. The story starts off with Spartan discovering instruction from a book that his father bought him to contact aliens. Once they contacted the aliens, a green egg appeared and took them on an adventure in the Amazon rainforest. From there they learn about the natives living in the Amazon rainforest and how the outside world is impacti Spartan & the Green Egg is a story told in comic book format. The story is about the adventure of Spartan and his friends Max, Katie, and Tor and their dog Grimm. The story starts off with Spartan discovering instruction from a book that his father bought him to contact aliens. Once they contacted the aliens, a green egg appeared and took them on an adventure in the Amazon rainforest. From there they learn about the natives living in the Amazon rainforest and how the outside world is impacting it. The story is quite educational about the rainforest and the effects it has in this world. It is a great way to teach our children of being environmental responsible for our current and future generations. The choice we make on the rainforest could impact us negatively in the future. The story is may be for readers from 5 years old and up but adults can also read this book and be educated about the rainforest. This graphic novel is striking with its bright colours and illustrations including much detail. I think that children could spend hours appreciating the pictures, even without the story. The story itself is one of magic, which is obviously an interesting topic to most children. The most significant underlying theme is that of sustaining the rainforest and the perils of deforestation. This is introduced in an informative yet simple enough way for children (I would say around age 7) to understand This graphic novel is striking with its bright colours and illustrations including much detail. I think that children could spend hours appreciating the pictures, even without the story. The story itself is one of magic, which is obviously an interesting topic to most children. The most significant underlying theme is that of sustaining the rainforest and the perils of deforestation. This is introduced in an informative yet simple enough way for children (I would say around age 7) to understand and to be intrigued by. I would have liked a bit more focus on Amazon culture and animals, which is briefly mentioned but not in any detail. Overall it is an enjoyable book with some interesting educational themes, and would be particularly good for an environment topic at school. The typos distract a little from the storyline which may be problematic in teaching children to read. Spartan and the Green Egg Series is a fun, unique graphic novel collection. With three books, each take us to an exciting part of our world! The first book, A Trip to the Rainforest, Spartan and his friends discover an alien life who shapes itself into a green egg. The green egg takes them on an adventure to the rainforest in the Amazon where they learn about deforestation and how the planet is being ruined by it. They meet native Amazons and learn more about their culture. Through Egg, the kids learn ways to help the forest and stop the loggers! I won this book through the Goodreads First-reads program and would like to thank Goodreads, Nabila and anyone else involved in supplying me with my copy. While this book had the potential to be used as a classroom resource to raise awareness about environmental issues, it unfortunately didn't hit the mark for me. There was a lot of emphasis on spirits/alien forces and the resolution of the story (involving a magical giant) was over-simplified. There were also typos that distracted me from the st I won this book through the Goodreads First-reads program and would like to thank Goodreads, Nabila and anyone else involved in supplying me with my copy. Nabila Khashoggi is the author of the Spartan & the Green Egg series of books, whose proceeds from sales go in part to support a nonprofit organization helping children in areas of extreme poverty around the world. Inspiring young readers to develop a thirst for travel, a respect for different cultures, and to view themselves as part of a larger global community, this unique series of graphic Nabila Khashoggi is the author of the Spartan & the Green Egg series of books, whose proceeds from sales go in part to support a nonprofit organization helping children in areas of extreme poverty around the world. Inspiring young readers to develop a thirst for travel, a respect for different cultures, and to view themselves as part of a larger global community, this unique series of graphic novels for children hopes to nurture a kindness for the planet and all who live on it. As a child, Nabila traveled extensively with her parents and has brought that love of travel and discovery to the 10 book series. To date, four books have been released with more planned in the immediate future. “I’ve never witnessed more generosity and willingness to help than I have with children,” says Khashoggi, “and if given the chance, our children will make our world a better place.” Khashoggi hopes that in some small part, her series can help nurture that giving spirit that all children seem to have. Spartan & the Green Egg graphic novels is being embraced both nationally and internationally, both as leisure reading and in the classroom. To support the books a wide range of accessories, such as world flag pins and collectible stickers go along with the book. A video game, trailers, games and puzzles are also some of the additional fare that accompany the book. Through her Explorer’s Club, based on the series, readers are able to become involved, which, Nabila adds, builds a solid foundation for the future health of the planet, and the many cultures that share it. Nabila currently lives in New York with her husband and two sons.